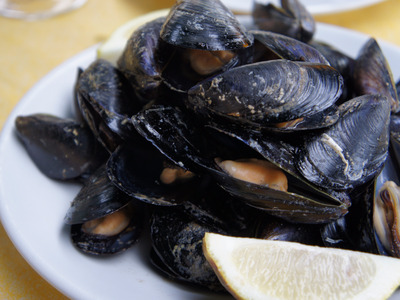 Mussels, the popular shellfish staple, are growing thinner shells, which could put them at great risk. In a study published June 15 in the Proceedings of the Royal Society B, researchers looked into differences in shell thickness among California mussels over time. They found that compared to mussel shells found today in the Pacific Ocean, the ones from 1,000 years ago were 27% thicker, while ones from the 1970s were 33% thicker. The researchers attributed this declining shell size to more acidic oceans, which keeps the mussels from building up their shells for their protection. Ocean acidification happens when more CO2 gets absorbed by saltwater. And since the Industrial Revolution (when we started producing more CO2), ocean acidity has gone up by 30%. This isn’t the first time this thinning has been observed. Back in 2014, researchers from the University of Washington observed a similar thinning effect. This led them to call mussels the new oysters, because the phenomena has also been observed in oyesters. Difficulties in growing hard shells could be difficult for more shellfish as well as ocean acidity continues to rise. The resesarchers note that if shell thickness keeps decreasing, it could put mussels’ survival at risk.